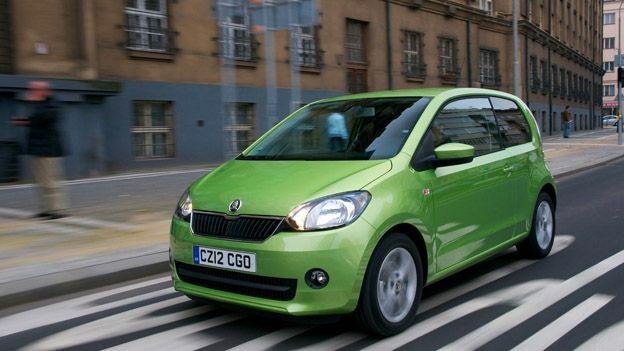 We want to get one thing clear before diving into this review: the Skoda Citigo isn't trying to be the next best thing. It's not trying to fool anyone with a high-end price tag and a stupidly long spec sheet, unlike the Kia Cee'd. The Citigo (we tested out the 60PS model) is an economically friendly and compact four-wheeler with an impressively low price tag - but for the right reasons. It's a bare minimum road hog with a particular purpose in mind: to get you from A to B comfortably and quickly, without guzzling the contents of the tank. Saying that, there are a few surprises in store. On the tech front, there's not much to shout about, but perhaps that's the point. For seven grand, we weren't expecting much when the Citigo appeared on our driveway. But once we looked inside, we were shocked to discover that it came complete with a detachable sat nav which, as far as we're concerned, is a pretty decent add-on. The touchscreen operated device is simple to use and easily removable from the mount. Also in the mix is bluetooth connectivity for making safe calls from behind the wheel and wireless music streaming for banging out tracks. Don't think just because it dons a reasonable price tag that the Citigo drives like a cheap and cheerful motor – although it's certainly no Range Rover Evoque, the three-cylinder engines ensures a speedy take-off and smooth drive. Although noise levels could be quieter, steering is light and responsive, making parking and turning a piece of cake. The inclusion of a detachable sat nav is a nice touch – you won't find many car manufacturers that will do this – and its compact crust and eco-friendly engine make it an affordable and practical city run around.